Son of Gabriele Rossetti and Frances Polidori. He spoke fluently Italian as well as English and was educated at King's College School (1837-1842), F.S. Cary's Academy of Art (1842-1846) and the Royal Academy Antique School. In 1847 he left school to concentrate on art. He sent a fan letter to Ford Madox Brown, whom he admired much. Brown thought Rossetti was being sarcastic and went to the Rossetti family home to give him a sound trashing. There he found to his surprise that Rossetti was absolutely sincere. Brown became Rossetti's mentor and their friendship lasted for life. 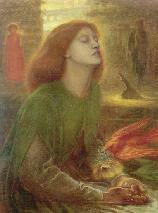 When he was only eighteen Rossetti wrote his poem "The Blessed Damozel", which stresses the importance of human love. In 1848 he founded the Pre-Raphaelite Brotherhood with William Holman Hunt, John Millais, James Collinson, Thomas Woolner, Frederic Stephen and his brother William Rossetti. They published "The Germ", a platform for their poetry and other art. In 1849 he first exhibited an important painting, "The Girlhood of Mary Virgin" (now at the Tate Gallery, London). In 1850 he met Lizzie Siddal, one of the models for the pre-raphaelite painters. She became his pupil as well as his lover and also an important source of inspiration. In 1851 they became engaged. In 1856 he met Edward Burne-Jones, William Morris and Algernon Swinburne to work on wall paintings for the Oxford Debating Union. In Oxford he met Jane Burdon. He fell in love with her, introduced her to William Morris and the latter married her in 1859. In spite of affairs with other women, he eventually married Lizzie Siddal in 1860. When she died in 1862 he buried his collected poetry with her. He painted "Beate Beatrice" in tribute to Lizzie and in later years he tried to contact her in seances. In 1869 he wanted his poetry back and in his absence Lizzie's coffin was opened. The volume was returned to him and with it reports of the state of her body. He was attacked from many sides because of this action, but he wrote to Swinburne that Lizzie would certainly have approved. When his poems were published he soon established a reputation as a poet. In 1871 his work was criticized severely by Robert Buchanan in "The Fleshy School of Poetry: Mr. D.G. 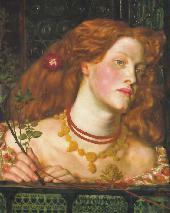 Rossetti". Rossetti responded, but in 1872 he broke down mentally as well as physically. He suffered from hallucinations and inner voices and was taken to Scotland where he tried to commit suicide. Rossetti never fully recovered, but soon he was able to paint again. For many years he took huge doses of whisky and laudanum to cure insomnia. This worsened of depressions and his health detoriated further. Later in life he was interested in spiritualism and he attended seances. But as early as 1855 he had written in a letter that he didn't believe in it and he probably remained a sceptic. 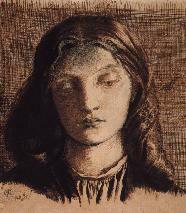 In his last years Rossetti was obsessed with "Janey" Morris, whose face appears in many of his paintings. In 1871 William Morris went to Iceland and left Rossetti with Jane at Kelmscott Manor in Oxfordshire. Jane claimed in later years that nothing really happened between them, but this seems hard to believe. Beyond dispute is that her daughters Jenny and May were both very fond of Rossetti. 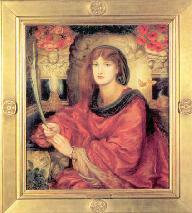 After posing for "Astarte Syriaca" Jane broke off her liaison with Rossetti whose mental stability was detoriating rapidly. By 1882 he suffered from Bright's disease and was nursed by Christina and William Michael in Birchington. His request to see Janey a last time was ignored by her and he died on April 9th in Birchington. He was in deep financial debt at the time pof his death and his brother had a hard time to keep the creditors and his model Fanny Cornforth away from the funeral arrangements. 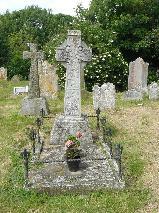 He had stated that he didn't want to be buried at Highgate Cemetery (where Lizzie Siddal was buried) and he was laid to rest in Burchington Churchyard, Kent. 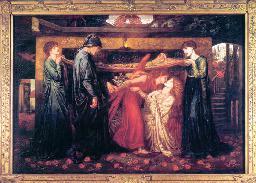 Burne-Jones couldn't face the funeral and said he was too ill. Janey and William Morris didn't come either. His old friend Ford Madox Brown was in Manchester but he designed the cross on Rossetti's grave and his daughter Lucy was at the funeral. Other models who had posed to Rossetti were Ruth Herbert, Annie Miller, Alexa Wilding and Marie Spartali, a talented painter herself. 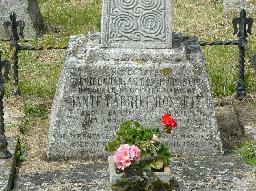 The grave of Dante Gabriel Rossetti at All Saints' Churchyard, Birchington. 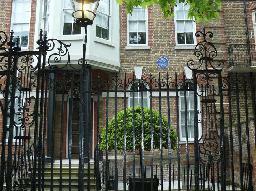 The house where Gabriel Dante Rossetti and Algernon Swinburne lived at Cheyne Walk, Chelsea London. "Portrait of Louisa Ruth Herbert". "Dante's Dream at the Time of the Death of Beatrice".